Acclaimed photographer Vincent Tremeau visited UNFPA programmes in Nepal and Iraq, where girls face a heightened risk of child marriage. He asked these children to dream of the future they want, and to create costumes depicting that future. 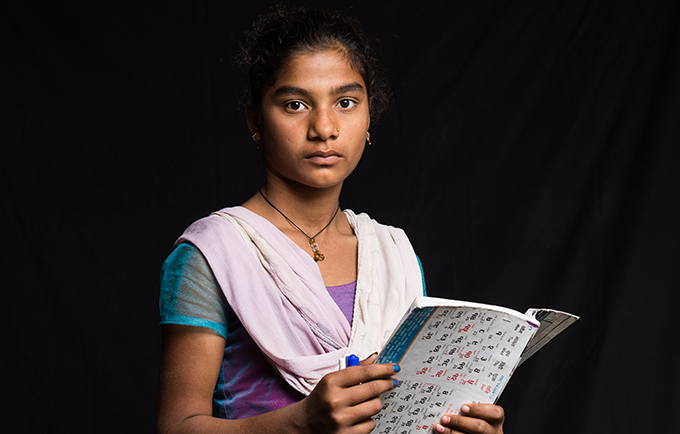 In rural Nepal, poverty and gender inequality mean that girls are often married off before their 18th birthdays. 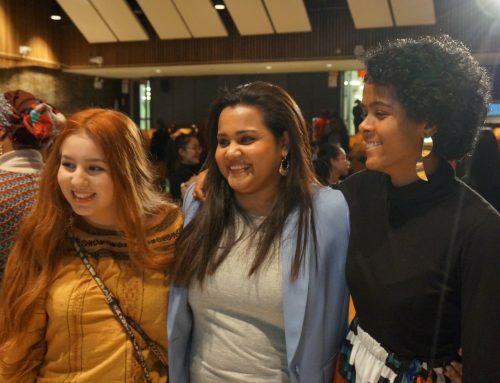 But dozens of girls showed up dressed as doctors, civil engineers, teachers, dancers, accountants and more – a testament to what they can achieve if they are allowed to fulfil their potential. In Iraqi displacement camps, Mr. Tremeau met child survivors of the bloody conflicts in both Iraq and Syria. They, too, had big dreams. “I love making things the most, so when I grow up I’m going to crochet and sew things all the time,” said Nufa, 12, from Abali, Iraq. Others came dressed as actors, sailors, artists or engineers. The images were collected under the theme “This Valentine’s Day, I don’t want flowers. I want a future.” They are the latest instalment of Mr. Tremeau’s ongoing photo series One Day I Will. All of the young participants were aware of child marriage – and some had seen its worst consequences. Globally, complications of pregnancy are the second leading killer of girls aged 15-19. And in developing countries, nine out of 10 births to adolescent girls take place within a marriage or union. In Nepal, more than 48 per cent of adult women report that they were married before reaching age 18. 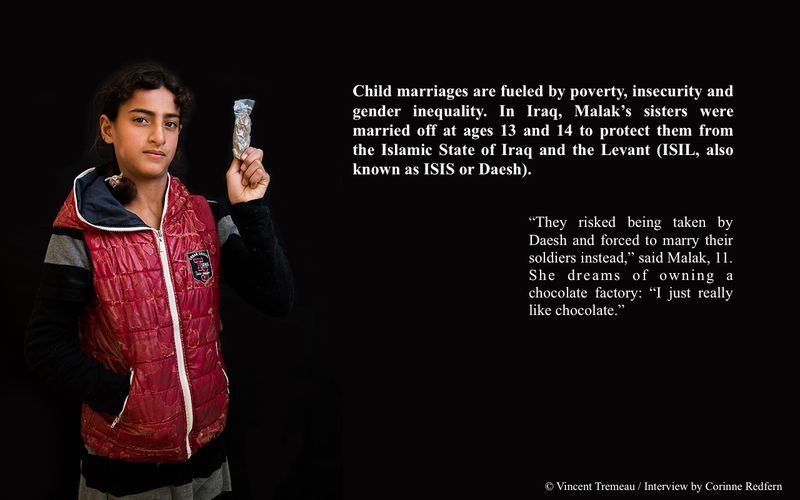 And in Iraq, more than a fifth of girls aged 15 to 19 are married, according to 2011 data. Conflict and displacement could be making things worse. For one girl’s family, child marriage seemed to be just one of several terrible choices. But in many cases, practical measures can help girls escape child marriage. Empowering girls to know and advocate for their rights is a critical first step. 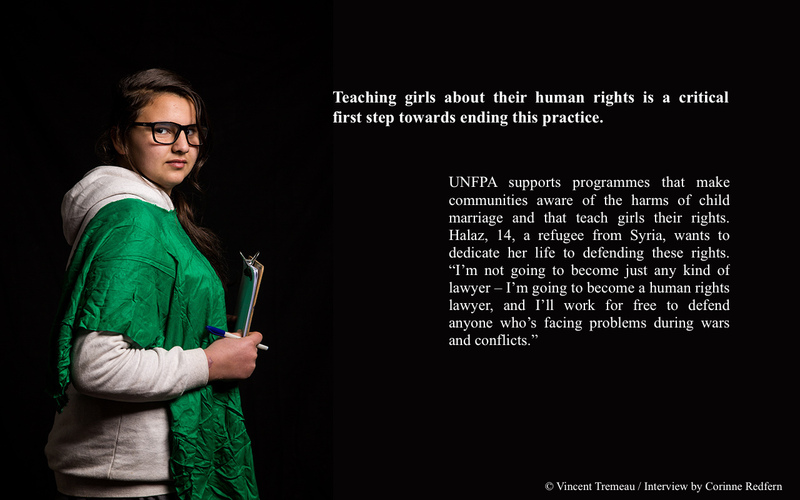 Heba, 11, learned about her rights from a UNFPA-supported programme in her Iraqi displacement camp. “I see sometimes here in the camp the parents of some girls talking about marriage and some of them want to do it, but I always tell them that it’s a bad thing for them,” she said. In a separate project, Palestinian artist Rand Jarallah used makeup to spread the word about child marriage. Five school-aged girls in New York volunteered to act as a canvas for Ms. Jarallah, a UNFPA Innovation Fellow.